2015 is almost over and it was a perfect year on so many levels ... A lot happened this year, a whole bunch of new friends, new places, new challenges, new experiences and new skills. It was also a year, I successfully made soap. I must admit, it is a very strange concept that everyday items can be turned into a bar of deep cleansing soap. I used mainly coconut oil which later I found to be very cleansing ... in fact, so cleansing that it can even be used laundry soap! My next project is to make a nourishing olive oil soap. Probably one of the scariest things I've done is to find new friends which often we don't think about. As children, it's something we do because we play in groups but as adults, we become very selective and seek those with common interests and personalities which makes the task of finding friends very daunting and difficult. I am not quite sure how I manged this, but I did end up with a few good friends. Another achievement for the year! December is a short working month and a very busy month for most of us. I don't know about you but for me, cooking is not a priority in busy times and often I end up eating a simple meal. I have been a huge fan of beetroot recently and end up with a small bowl of left over cooked beetroot. It can easily be made into a dip. I didn't really follow Ottolenghi's recipe but this is one of his creations. I usually add some chopped walnuts and sprinkle with some hard crumbly feta on top. 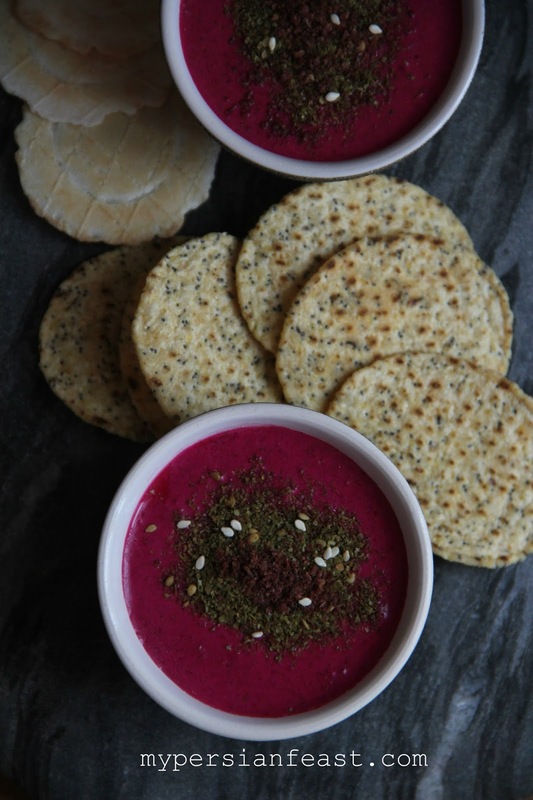 This is best served with pita bread or crispy lavash. However you choose to make it, make sure you add date syrup as it counteracts the earthiness of beetroot very well. My blogging energy hits a new low during warmer days but today, was an unusual miserable Auckland spring day, which was just perfect for shopping and cooking (and taking a photo or two). 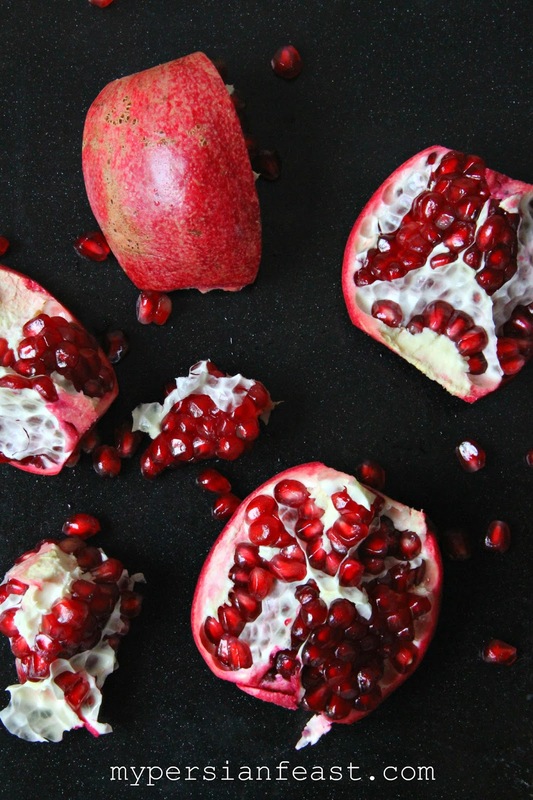 If you have noticed the two very bruised pomegranate seeds in my pomegranate photo last year, today is your lucky day! I took another photo of a pomegranate and here it is ... with much better colour and clarity than last year. In trying to come up with ideas for today's blog post that don't require me driving across town to buy special ingredients, I came up with this dish. For Iranians, this is a perfect peasant food. It's the kinda dish you'll never cook for your guests - it's a perfect mid-week vegetarian dish that doesn't require much effort when you are too busy and you don't have time for food shopping. Lentil rice is cooked with either raisins, dates or beef mince (or a combination of all) or just plain and served with fried eggs. Persians don't spice it up either; only some regions add cinnamon to it. 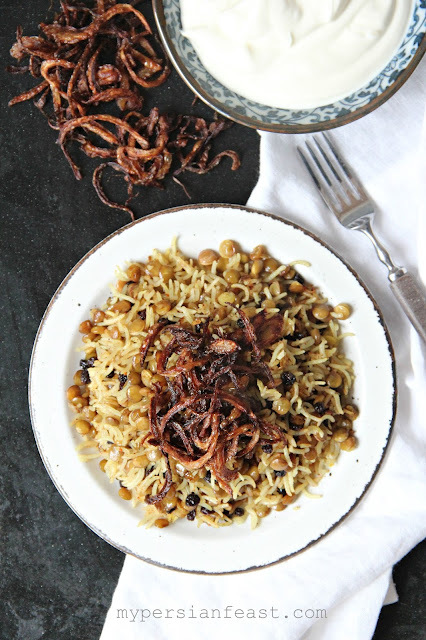 Various versions of this dish is cooked all over Middle East and is called: majadra, mejadra, moujadara, mudardara, and megadarra ... but really they all refer to the same lentil rice cooked with slightly different combinations of spices and lentils. I added currants to mine as I prefer tiny currants to sultanas or raisins in any recipe. I must admit spices add a very subtle warmth to this dish, which is a nice change to what I'm used to. Fried onion flakes are full of flavour and adds the much needed texture to lentils and rice. Serve this rice dish with yoghurt and plenty of crunchy fried onions. Place the lentils in a small saucepan with enough water to cover the lentils. Bring to a boil, cool for approximately 10 mins or until the lentils are soft (but not mushy i.e. with a bite). Peel and slice the onions finely. Heat some cooking oil in a pot (approximately half a cup). Fry onion slices in batches until golden. Remove golden crunchy slices with a spoon and set aside. Leave about 2 tablespoons of oil in the pot and reduce heat to medium. Add the ground spices and cook on medium heat for two minutes. Add the drained lentils and the currants, mix well and fry for 1-2 minutes. Add the rice, water and salt, mix and allow to boil. Reduce heat to very low. Cover the lid with a tea towel completely. Place the lid on, making sure its sealed tightly. Allow the rice to steam for 10-15 minutes - until the rice is cooked fluffy. Ah, the much needed long weekend is finally here and as usual I planned way too many activities for this weekend ... I just got back from a week in Queenstown so, I am still in a holiday mode. I've managed to make raw cashew and raspberry truffles which is super delicious and have started making numerous salads. Follow me on Instagram to see my food journey if you haven't done it yet. Legumes, I cannot say much about them! They are not my favorite food group to eat, however if anyone is willing to cook with them for me I'll happily eat whatever is in front of me :) It is the season for fresh broad beans so best to make an effort to cook with fresh broad beans as they have a much better flavour and texture than frozen ones. Broad beans are one of those beans that can be simply boiled, seasoned and enjoyed, but if you are after something requiring more work then add some dill and broad beans to your rice for a fragrant dish that can be enjoyed with chicken or lamb. I have cooked some fresh broad beans in a little water and seasoned with some Persian hogwood, salt and lemon juice for an afternoon snack. This is not a meal but something very nutritious you can enjoy on long spring afternoons! 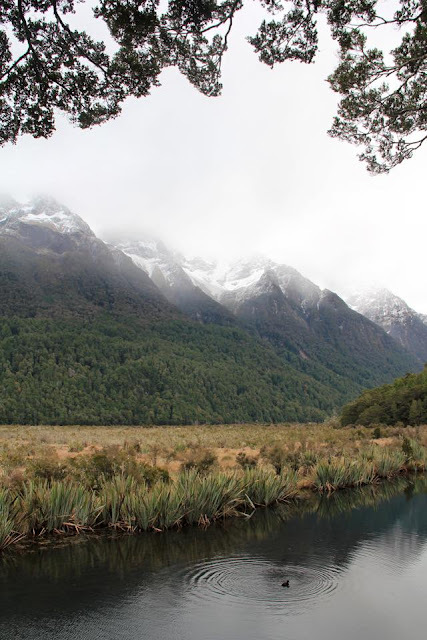 Here is a photo I took in Fiordland National Park. I am not a landscape or a travel photographer and really don't enjoy carrying a camera with me but this view was worth it ... I waited for a few minutes for the duck to do its thing, took a few shots before seeing the tree above and heard my heart palpitating as a thin layer of rain covered my lens. I have never sprinted so fast in my life for cover! A very uneventful week was all I needed after my previous week! I decided to walk down to the beach this morning. The 8 kms return trip was very rewarding in the end. The Sunday market was on and I, not being a market person, decided to go for a browse. I managed to find a stall this morning with probably the best sales man I have ever encountered. He knew where his stuff actually came from, and gave me the look of death when I tried to bargain down a Devonshire Pottery mug. I knew too well about Devonshire Pottry but decided to pretend I was ignorant. In the end, I decided to try my luck one more time on an English knife and Scandinavian cookie cutters and not only he accepted half what he asked for but pulled out an 80 year old English plate from his stash for me to have a look at it. He didn't take his hands off the plate though! I think I may have found my go to stall for all things vintage tableware. Back at home, the garden is going strong and we have picked a basket full of Persian Cress (shahi, شاهی or tartizak, ترتیزک) - strong peppery soft leaves perfect for salads. I made a salad last year with it and got asked many times about it. You can't buy them here unless you know a Persian who grows these! 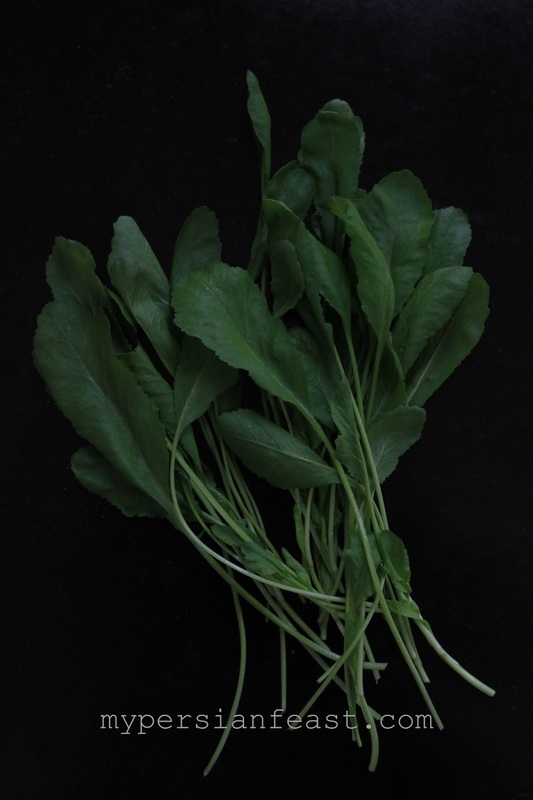 Below is another photo of a very mature cress (about to seed). Tonight is one of those nights, I am struggling to write this blog post. This shouldn't be difficult for me. I am the go-to person for all those people who need perfectly constructed sentences or a convincing argument on a piece of paper and usually very last minute! Well, I've had some feedback from my blog readers who have all requested more and more insights from my everyday life and I'm trying my best tell you what I usually do. I work full time in an ordinary office job but please don't get scenes of "Julie and Julia" in your head (yes, the one scene where she was trying to come up for the next best thing she could do in her life). You have no idea how happy I was when all Julie scenes were finally cut out of the movie! I ended up watching it over and over again, just like a child obsessed with a Disney character, bawled my eyes out over the initial Julia scenes when she struggled and jumped for joy when her book was delivered to her doorstep. I was so obsessed with the new half version, without all the annoying parts, that I found myself unconscionably reaching for my phone and watching it in the wee hours of the morning and weeping. Blogging is an enjoyable hobby for me but I have certainly not pulled a sickie to dedicate a whole day to cooking! The weather was absolutely amazing this weekend. Finally, it felt as if summer is almost here! I went on a couple of walks and went to the swimming pool. I've never been keen on swimming, but I'm forcing myself to perfect a couple of techniques. The last time I had a swimming instructor, it ended badly! I had a 5 minute argument with him in the pool trying to tell him that my toes were pointing the right direction without realising that he wasn't telling me off for my toes! I still don't know how he managed to keep calm and act as if nothing happened. I am definitely not proud of a few achievements this weekend - I accidentally poured coffee on a random dog on the beach while trying not to bump into any dogs, walked almost into a power pole and made a wrong turn onto a one-way street! I managed to hit the brakes and almost everything flew in the car and did a U turn to get myself and poor Fey (my car) out of trouble. I survived in the end! It was a busy weekend in the cooking department. I made jeweled rice yesterday and today decided on something light and fresh. Although, with the eventful weekend that I had, I could manage a shortcut version of the omelette. Usually, I would stay far away from canned vegetables as the flavour is not spot on. So, here it is, a quick dinner I grew up on. Maman often made this during summer very late at night after hours of sewing. These days though, we don't eat dinner late at night but still is our quick favourite dish on a summer day when tomatoes are picked ripe and you can smell them from meters away. 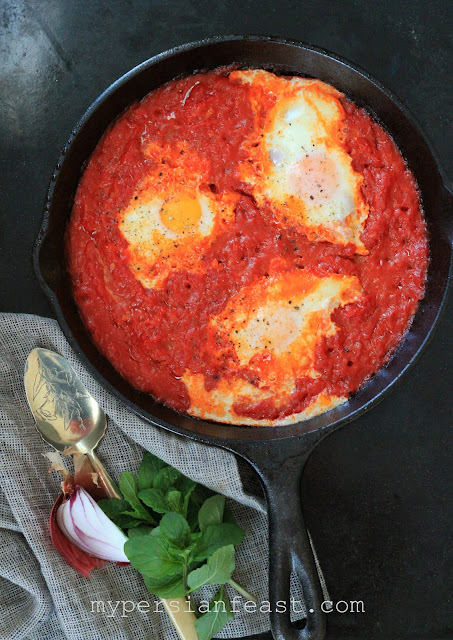 This is a Shakshuka style dish traditionally served for breakfast but these days something quick and as wholesome as this can be eaten any time of the day really. To make this omelette, take 3 ingredients and you are half way there. 1 medium onion, 2 cans of chopped tomatoes and 4 eggs. If you have plenty of fresh tomatoes, I suggest you peel them first, then chop them in half and remove the seeds and chop roughly. I suggest 2-3 medium tomatoes per egg. Sautee chopped onion with a little olive oil and add chopped tomatoes. Cook on reduced heat until it thickens (approx. 20 minutes for 2 cans of tomatoes but it will take twice as long if you start with fresh tomatoes). Crack the eggs into the sauce and cook until eggs are firm. Season with salt and pepper. Serve with fresh onion slices, green herbs and crusty bread. I don't have an exciting post for you this time other than my favourite combination of beetroot, feta and walnut. Beetroot and feta is an explosion of edgy and bald flavours. If you are a food blogger yourself, you know very well that the world of food blogging is not as glamorous as it seems! There's the planning, shopping, cooking and the few minutes you get to take a photo but only to realise that none of your photos are half decent! To take the pressure of disappointing myself at the end of a 4 hour blogging work, I went for an easy option - as salads are photogenic and half the hard work is done! I'm loving beetroot at the moment and its not everyday you can find golden beetroots in the supermarket. 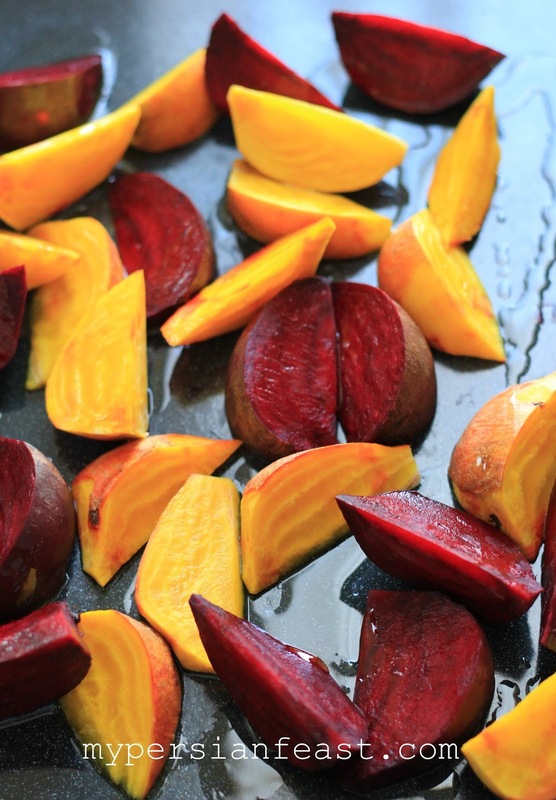 Golden beetroot is not as earthy as the ordinary ones but it sure adds another colour to your plate. Autumn is long gone but if you enjoy the fresh taste of autumn walnuts then you can soak them in water overnight and use them in salads which is what I've done here. 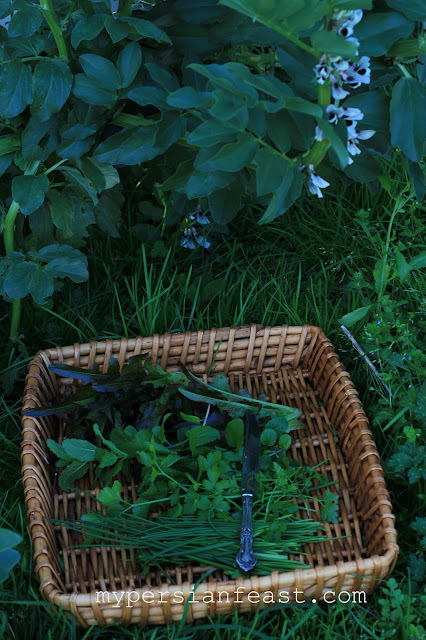 Spring is great for fresh produce and if you are lucky enough to have a well looked after veggie garden then hand picking some fresh herbs and crispy salad leaves from your backyard is a better option than a trip to the supermarket. Lettuce, parsley, chives and mint are currently growing in abundance in our backyard and soon we should have broadbeans and Persian cress which I'm very excited about. Did I say I went for an easy option?!?! Chopping and roasting beetroot is no hard task and neither is picking greens and washing them! Next, roughly chop herbs and let's assemble the salad. If you rather do a Jamie Oliver and get your hands dirty then go ahead, but I prefer the more delicate and classy way of layering the salad components and going for a simple and effortless look. The dressing? Go with a balsamic vinegarette with a little maple syrup to sweeten it. There are many versions of this salad and no matter if you choose feta or goats cheese or another creamy cheese, you'll still end up making an amazing salad. I don't enjoy cooking with a recipe in front of me - I suggest you go with what you think will work .... Create and live a little, and if its a disaster, try something new! The other day someone asked me how much is saffron and where should one buy it. Well, not all saffron threads are created equal and choosing the right saffron is very technical, as saffron is a graded product. The standards for each grade of saffron is set by ISO and is based on intensity of colour, flavour and aroma. In short, the highest quality saffron is the Iranian sargol (equivalent to the Spanish coupé) - only the red stigma tips with high concentration of colour and flavour. Low quality and strength saffron is a mix of red stigma and yellow style. Saffron threads should not be too old, must be dry and brittle and best kept in an air tight container in the freezer. Persians don't use dry saffron threads in cooking. Saffron threads or ground saffron should be brewed into a deep crimson coloured tea and can be kept in the fridge for a few days. Personally, I prefer the rustic look of saffron threads in my food. 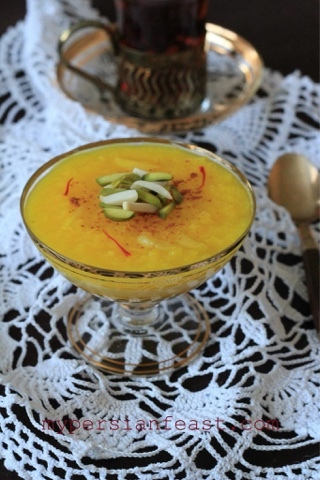 If you are after an exotic and fragrant rice pudding then this saffron and rosewater rice pudding is a must try. In a large pot, add the rice, water, half of brewed saffron and bring to a boil. Simmer on low heat, until the rice grains completely break into pieces and when tasted, it should be very creamy. Add the almond pieces and keep simmering until the pudding starts to thicken. Add more water if the pudding is not very smooth and creamy. Add the rosewater, saffron, butter and sugar. Simmer for about 10 minutes or until the sugar is completely dissolved. Serve with cinnamon and chopped almonds and pistachios. Traditionally, this pudding is served warm. It thickens when cold and some people love it cold. If you are under the impression that Persians eat a lot of chicken, well, unfortunately you have not experienced a proper Persian feast. All over Middle East, lamb is the preferred red meat but we don't hear much about duck. 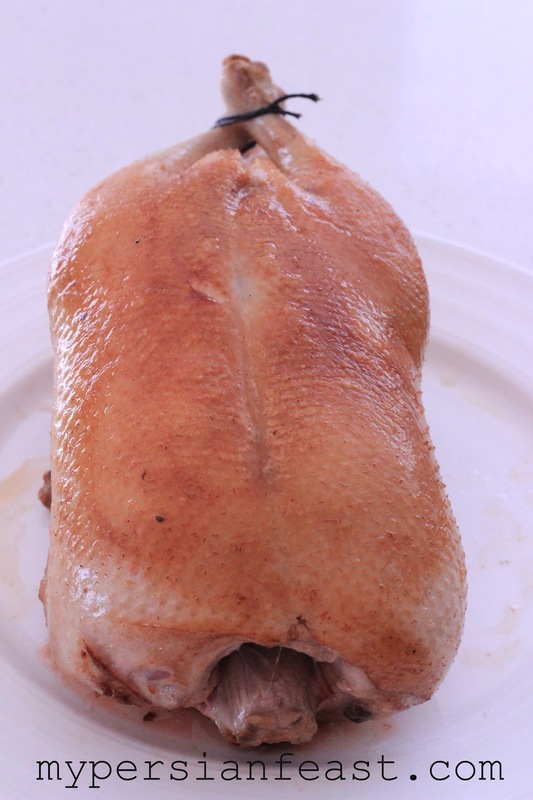 Please don't get images of Chinese roast duck or duck confit in your head. Duck is a beautiful meat and is perfect when cooked with tart fruits such as tart cherries, tart plums and pomegranate. I grew up eating duck cooked with dried pomegranate seeds. Let me make one thing very clear about pomegranates. There are two types of pomegranates; the sweet Californian ones we get in NZ and the sour wild variety which is not available in NZ. 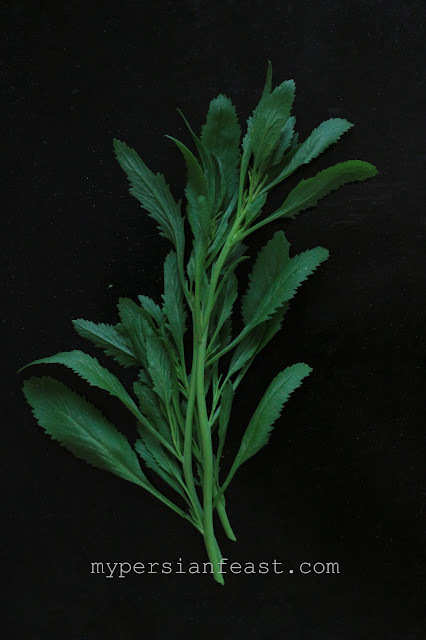 The sour wild variety is only used for cooking and the sweet variety is only eaten as fresh or juiced. 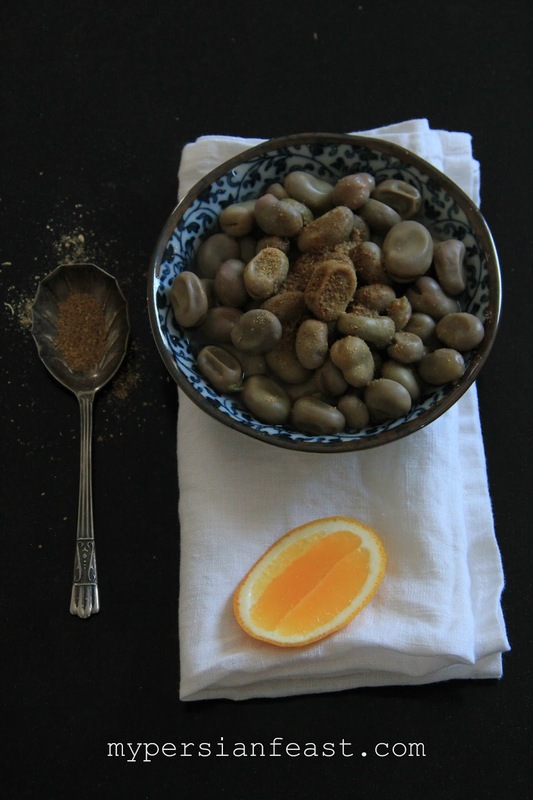 The sour variety seeds are dried whole and used as ground, whole seeds in stews or cooked into a paste. The most popular way to use the sour variety is as pomegranate paste. Again, let's not confuse "pomegranate paste" with "pomegranate molasses", as they are completely two different products. Pomegranate molasses is reduced pomegranate and lemon juice. Pomegranate paste, as the name suggests, is pure pomegranate paste with nothing added to it. Persians traditionally do not use pomegranate molasses, but if the paste is not available then the molasses will do. 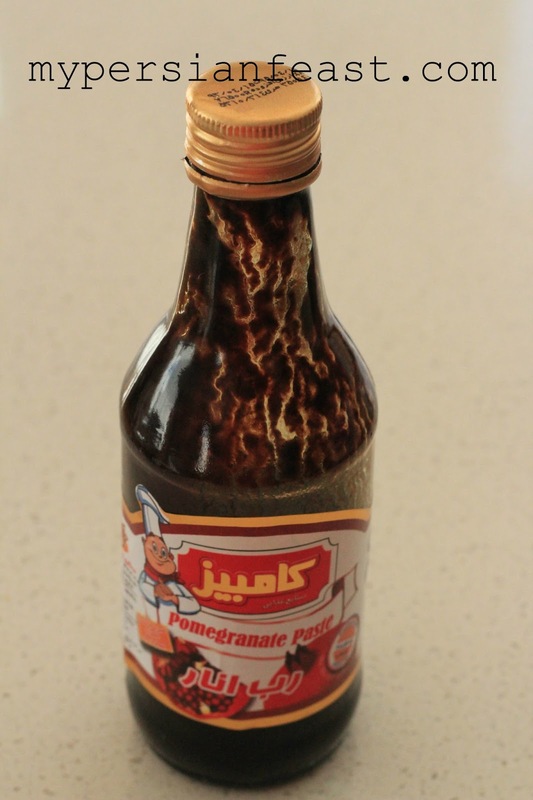 Commercially prepared pomegranate paste is reduced pomegranate juice (photo below), still a better alternative than pomegranate molasses. Many years ago, my family made a foraging trip to a thick sandy pomegranate bush. It was near the sea so, the day trip was worth it. In a hot autumn day, we helped ourselves to bag after bag of tiny pomegranates before realising that we lost one of our crew members. After a little panicking and spending some time finding everyone, we ran into a local man who very wisely told us that someone was murdered in this bush not long ago. That was our first and last pomegranate foraging trip! Fesenjoon (or properly known as Fesenjan) is a sweet and sour stew traditionally cooked with duck or chicken and thickened with ground walnuts. Its an autumn dish when pomegranates are ready for picking and walnuts are in season. 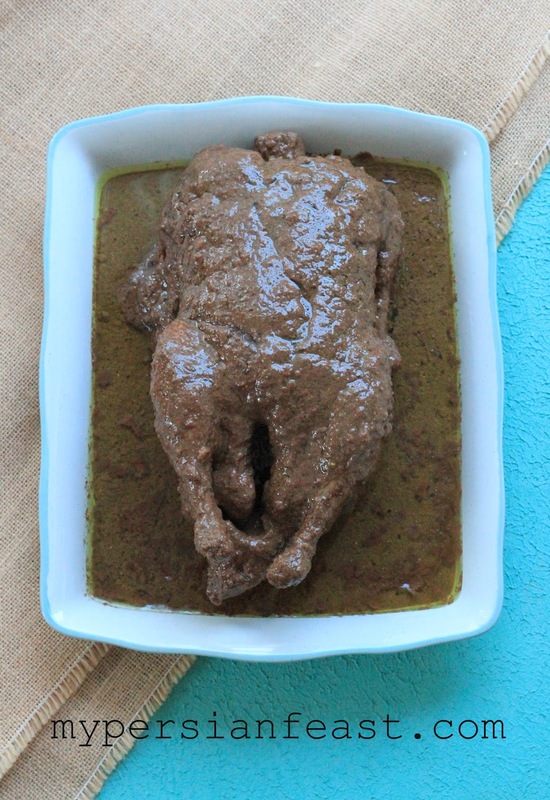 Duck, wild turkey, goose or any wild birds are the preferred meat for this dish in the Caspian region. There are regional varieties of Fesenjoon in Iran, and our favourite is what our grandmothers and mothers cooked for us - with duck. I have been patiently waiting for my photography skills to develop to write a blog post about this dish. Sadly, Fesenjoon is not very photogenic but don't let the unappetising colour of the dish put you off. 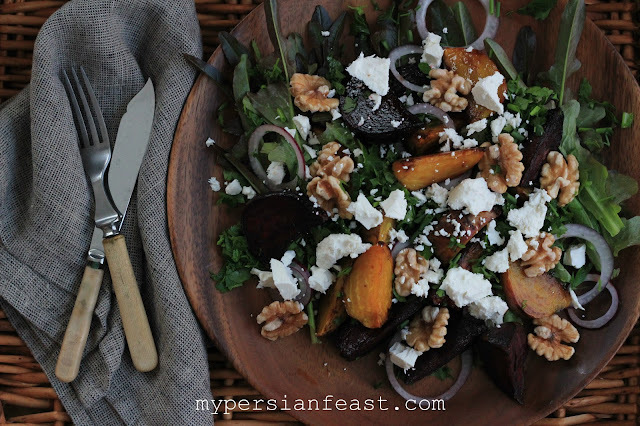 Fesenjoon usually doesn't get a bad review unless you serve it in the heat of summer. You'll need hours and hours of simmering until a thick layer of walnut oil appears on top. I haven't tried this in a slow cooker but I suspect it can work. Fesenjoon tastes better the next day as Persians say it will "fall into place" meaning perfectly executed. Heat a large pot (to fit the duck) on high heat. Cut off a little duck fat and fry it until completely golden. Place the duck slowly in the pot and fry the duck until golden. Turn occasionally until all sides are golden. Remove the duck from the pot and set aside. At this stage, there should be about 1/3 cup of duck fat in the pot. Pour the fat into a bowl and leave a 1-2 tablespoons for frying the onion. Add the grated onion and turmeric, continue to fry for a few minutes. Add ground walnuts and fry for 3-5 minutes. Walnuts burn very quickly, when you start to smell roasted walnuts then its time to add water. (this stage depends on how much oil is in the walnuts). Whisk until smooth, reduce heat and place the lid on. When the walnut mix comes to a boil, remove the lid and wait for the mixture to slightly thicken (approx. 15 minutes). Place the duck in the walnut mix, place the lid on and simmer for 2 hours. By now, it should be thick and duck should be cooked. A thick layer of walnut oil should be sitting on top. Add the pomegranate paste and taste it after 15 minutes. Adjust the flavour to your liking with brown sugar, salt and pepper. (approx. 1/3 cup of brown sugar should be sufficient). Hint: if using chicken, fry the chicken with olive oil and use 4 cups of water. It will take a much shorter time to cook. 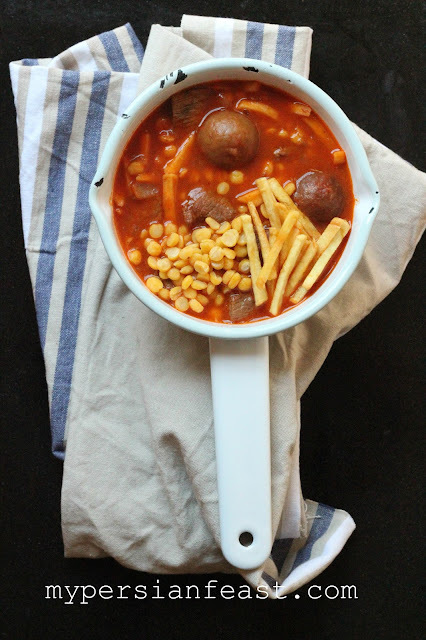 Food in winter is all about generous amounts of carbs. I notice carbs these days as I am on an almost-paleo diet. It all began for no real reason but the honest truth is ... I don't get the paleo diet! Everytime I heard the word paleo, I used to get images of cavemen sitting around a bonfire eating grilled meat. It is a diet worth criticising; it lacks major nutrients. I don't blog as often as I used to and get the urge to spiel what I did in between my blog posts. Well, if you follow me on Twitter then you know more about me than I know about myself. A few weeks ago, I volunteered at the Auckland Festival of Photography and attended a food photography workshop. I've got a few words to say about photographers... If you ever want to know what it means to be humble then meet a photographer. A bunch of down to earth individuals who couldn't proudly say in one sentence that they were exhibiting their work. The professional photographer's facial impressions ranged from amazement to surprise when they walked through the front door and that was my clue for spotting them. I must say not a chatty bunch but ask them if they are photographers and they would talk about everything to do with photography than answer the question! The other day I chopped a leg of lamb into pieces under the careful watch of Maman and made a stew. I don't tell her that I kinda like her treating me as an amateur cook then she will tell me every fine detail there is to know about a particular dish. Priceless moments they are! Gheymeh is a stew, more like a well-balanced casserole. I remember the last time I had this stew cooked by an amateur. It was more like soup, the yellow split peas turned mooshy and the fries? Well, the cook thought it was for decoration and no limes. This is probably the easiest Persian dish to make. The message here is not to use yellow split peas and simmer until reduced into a rich sauce. 1- Heat two tablespoons of cooking oil in a pot and add chopped onions. 2- Stir occasionally until the onion pieces are golden. Add the meat and chopped garlic. 3- Brown the meat until golden brown, stirring occasionally. When the meat starts to sizzle, its done. 4- Poke the lemons with a sharp knife and add them in. 5- Add 4-6 cups of water and reduce heat to low. 6- Place the lid on and allow to simmer for around an hour. The meat should be cooked at this stage. 7- Add tomato paste, drained chana dal and simmer for around 20-30 minutes. Add more water if it needs it. 8- In a small fry pan, heat some oil and fry the potatoe pieces until golden crunchy. Drain on a paper towel. 9- Add the fries to the stew and season with salt and pepper and turn off the heat. 10- Serve with steamed rice. You don't have to eat the limes! I cannot believe it's been almost 4 months since our last blog post. If you have been wondering what on earth we have been up to ... well, not much. There was a time in the new year, when I decided I had enough of blogging and wasn't going back to touching my camera yet alone cook anything photo worthy. Well, life threw me a few little good surprises here and there and finally I must say, this month has been a great month so far on so many levels and it definitely is a month for celebrating my greatest achievement! Autumn, I cannot say enough about autumn. If you love tropical warm weather and love summer, please don't try to understand why I love autumn. It is what it is, cool crisp mornings, warm afternoons and chilly evenings with more time to be spent indoors on reading and cooking dishes that take longer and you can truly enjoy them in cooler months. I was once criticised for saying this, apparently people enjoy hot soups in summer or they can eat warming dishes in summer too. Sure, whatever floats your boat! There seem to be two groups of people in the food world; the ones that have it all, I mean they have inspiration, they know good food, they know the role culture plays in cooking and you can taste their soul in their dish (trust me it is taste-able) and then there are those that have the knowledge but lack true understanding of what cooking is all about. They are the ones who make a huge fuss about pronouncing names of dishes correctly in a foreign language, they go to great lengths to find the best imported ingredients and then you sit at their dinner table and they hand you a plate of misery. I am not sure why some cooks have not understood that inspiration and love in a dish are ingredients and there for you to taste. Just an observation I have made, nothing major. Do not worry, if your style is to get your hands on a recipe and do the exact same thing then go for it! My question for this rant is, how do you share your joy of cooking and inspiration through a recipe? I am not Irma Rombauer and not capable of sharing my joy of cooking. I can merely share recipes here, but if you have cracked the code please let me know. One of the reasons I love autumn is tonight's dinner. Meatballs are perfect for cooler days and the giant Persian meatballs have rice, chana dal (similar to yellow split peas) and herbs in them. It is a complete dish on it's own and with some crusty bread to soak up the broth nothing gets better than this! Drain the rice and chana dal. Par-boil rice and chana dal in a small sauce pan with little water until just tender and drain. You could do this separately or together in one saucepan. Add the mince and herbs to the rice and chana dal and mix well. Add one slightly beaten egg and mix by hand or alternatively you could place all ingredients in a food processor bowl and process until well mixed. Take a handful of the mix and slightly flatten it. In the center place a few prunes or a hard boiled egg or a few pieces of walnuts and shape into a ball. Set aside. In a pot, saute chopped onion with a little oil and add the tomato paste. Once the water comes to a boil, reduce heat and gently slide the meatballs into the pot. Put the lid on and allow to simmer for at least an hour. 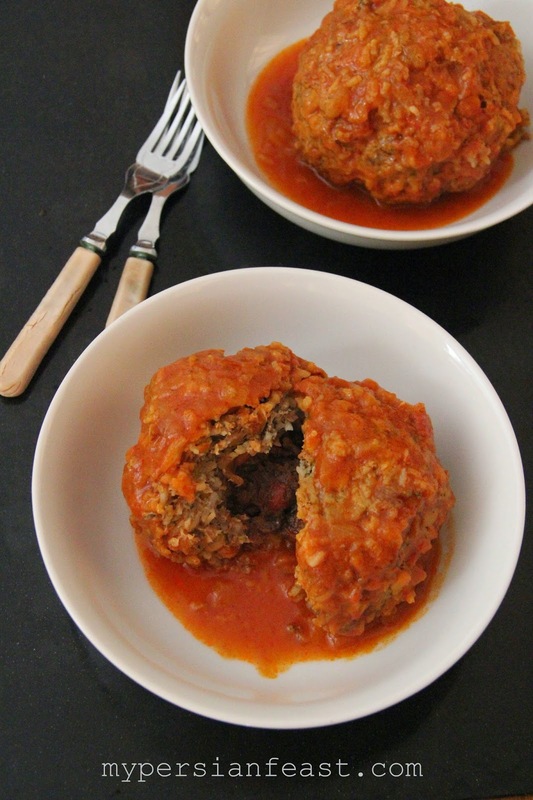 Check the meatballs occasionally and turn them for even cooking. Add more water/stock depending on how you like the broth. * Substitute with dry herbs if you prefer. We are two sisters living in two cities (Wellington and Auckland, New Zealand). We are passionate about food and all things Persian. My Persian Feast takes you on a culinary journey through the cuisine of modern day Iran where the regional culinary differences, the richness of culture and their legendary hospitality provide a perfect backdrop for one of the world's most ancient and diverse cuisines. We also introduce the most complicated and humble recipes of the Caspian Region along with new interpretations and creations inspired by Persian flavours. Welcome to My Persian Feast! Unless otherwise stated, all content on this site (including text, images and graphics as well as the overall design and concepts) is our copyright and all rights are reserved. Please don’t copy, adapt, redistribute, steal, pinch, pilfer or otherwise use anything found on this site without our permission. Please just ask – We are usually happy to share.